Here the author of Love’s Executioner and Momma and the Meaning of Life offers us some fruits of his 45 years as a practicing psychiatrist and therapist. This 2009 edition includes more than twenty pages of new therapy tips by the author. This is an idiosyncratic mélange of ideas and techniques that I have found useful in my work. These ideas are so personal, opinionated, and occasionally original that the reader is unlikely to encounter them elsewhere. I selected the eighty-five categories in this volume randomly guided by my passion for the task rather than any particular order or system. ª The hazards and privileges of being a therapist. ª Full Interpretation of a Dream—Forget it! ª Decisions—a Via Regia into Existential Bedrock. This text is sprinkled with many of my favorite specific phrases and interventions. At the same time I encourage spontaneity and creativity. Hence do not view my idiosyncratic interventions as a specific procedural recipe; they represent my own perspective and my attempt to reach inside to find my own style and voice. Also by Irvin Yalom are the novels Lying on the Couch and When Nietzsche Wept. 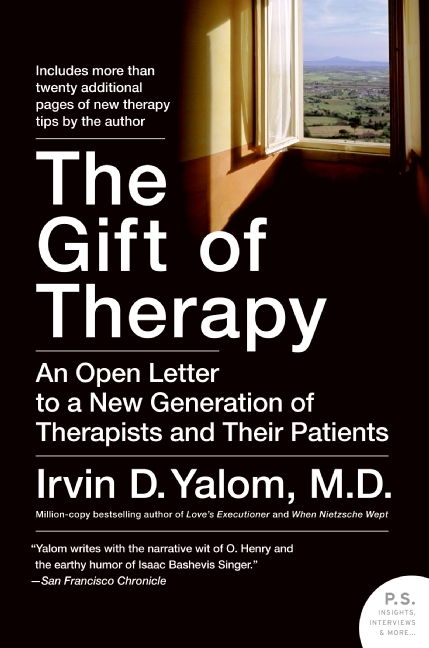 A book aimed at enriching the therapeutic process for a new generation of patients and counselors, Yalom's Gift of Therapy is an entertaining, informative, and insightful read for anyone with an interest in the subject.